Through the medium of documentary film, each year the SA Eco Film Festival aims to raise awareness and bring attention to the numerous prominent environmental issues that our planet is currently facing. Additionally, the festival highlights and celebrates the innovative solutions that people around the world are developing in order to combat these issues. This year, selected films were screened at The Labia Theatre in Cape Town, The Bioscope Independent Cinema in Johannesburg, and the African Leadership Academy in Johannesburg. Films screened fell under the following themes: The Ocean; Business and Industry; Food and Organic Living; Future Energy Choices. South African content received special treatment with the festival holding two premier events in Cape Town this year specifically tailored for local productions. Through two free screening events the SA Eco Film Festival showcased a wide range of local filmmakers and their productions. 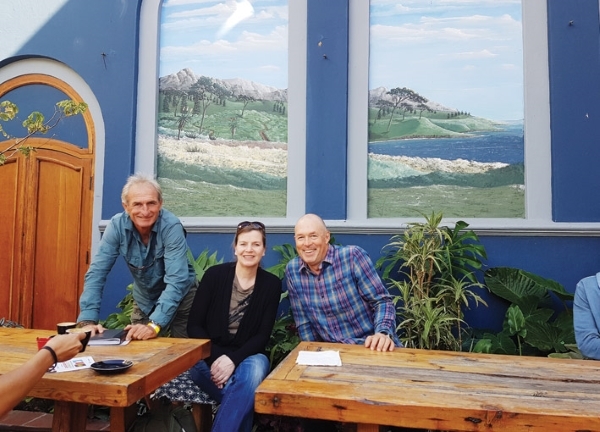 This edition saw the birth of the Eco Shorts Film Festival, which showcased five local eco shorts at the Bo-OP in Cape Town with introductions from the filmmakers themselves. An open air screening was held at the V&A Waterfront Amphitheatre where guests were treated to “sneak previews” of much-anticipated South African documentaries currently in production. The Talent Campus Breakfast Panels were held at The Labia Theatre on 24 and 25 March as part of the festival. In addition to the Talent Campus participants and industry leaders, the Breakfast Panels were open to the public and were presented as “master class conversations”. The Saturday morning panel was focused on crowd-funding, with panellist Patrick Schofield speaking on the popular Thundafund platform, and local director Tim Greene, who crowd-funded his film A Boy Called Twist, sharing his insights. Sunday’s session was hosted by local director Bruce Young (Blood Lion) and director Mariette Faber (The Man Who Wanted to Change the World) from the Netherlands. The two spoke on their journey as directors, sharing with attendees how they found their story, what they learnt during filming, as well as how they sourced funding to bring their project to life. “We held two panels that were open to the public as sort of ‘master classes’ – while we should have done better on the attendance stakes, they were fantastic sessions, with productive actions coming out of both: a valuable learning curb for us that these sessions (attempted for the first time) are very worth doing,” explains Schofield. With the breakfast panels, Schofield says that they took the approach of looking at what might support a filmmaker the most by asking within the industry. There were two consistent themes that arose from those discussions: where to find funding, and how to gain experience. “We tried to address those in a small way by offering a panel on crowd-funding, featuring two directors who have crowd-funded, and a panel with an international director as well as two local directors,” says Schofield. “With our audience growing, and what appears to be the success of creating ‘an event’ more than simple screenings, we would like to look at building the festival atmosphere in the different cities where the festival is held – this year was very Cape Town-focused. We have also been fortunate in partnering with some incredible companies from the start, who have worked sustainable living into their ethos and help us happen, if we can we would like to nurture that style of existence – where we’re truly proud to be supported by the companies that support us,” concludes Schofield.